The new framework was successfully tested at Scania in the Netherlands. This company considers logistics outsourcing, to meet an expected increase in demand. Scania is an excellent example of a lean network. Not only their individual plants are lean, but the materials also flow between factories in high frequency and with small volumes and buffers. The idea is to approach a one piece flow in the sequence as ordered by the customers. The just-in-sequence logistics of Scania resembles a smoothly streaming river, ending in customer-specific assembled trucks. The capital-intensive part of the production is done in Sweden, and the final assembly is done at several locations near the customers. One of the final assembly plants is located in the city of Zwolle in the Netherlands. Due to the economic recession, there was a sharp decrease in the production rate within this factory at the end of 2008. 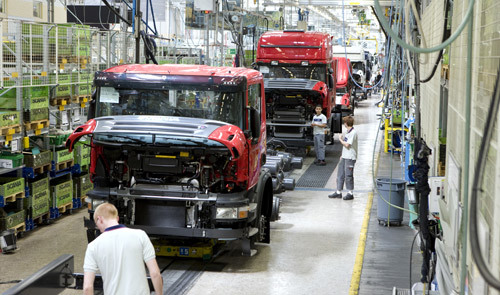 Today however, Scania Production Zwolle (SPZ) is back at the level before the recession. Every ‘takt time’ of 5 minutes and 33 seconds a truck leaves their plant. Scania has been profitable each year since 1934, even during the recent economic crisis. The production continuously increased, dips like the recent one were always temporary. For SPZ this implies that they probably will have to cope with a 50% higher demand in the near future. This alone brings more material handling, and besides that the number of truck variants is increasing. One of the reasons is that the customers order trucks with different European emission standards: euro 3, 4 and 5. To meet the expected increase in demand and related material handling, SPZ is investigating the possibility to outsource part of their logistics. Currently, cross-docks are used to combine materials for transport in fully loaded trucks. However, before these materials can be transported to the assembly lines after arrival, material handling activities are often required. This part of the logistics is now considered for outsourcing. The main question comes down to: Which material handling can be outsourced, where, and to who (for example to a supplier or a logistic service party)? For Scania it is very important to answer these kind of questions beforehand in a structured way. Not only is the business value of their logistics considered high and strategic, in addition making wrong decisions could disturb the lean flow in their entire production network. 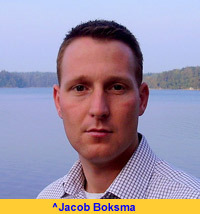 Today, Jacob Boksma is group leader production at SPZ. Before that, he studied technology management at the university of Groningen in the Netherlands, under guidance of Warse Klingenberg. The master thesis of Boksma dealt exactly with the kind of problem that Scania faces today: Is there a structured way to evaluate options to outsource part of their logistics, including material handling? For making decisions about material handling it is important to know if you are, in the supply chain, at a position before the Customer Order Decoupling Point (CODP), or at or even after this point. The new conceptional framework to evaluate outsourcing possibilities therefore has two axis. The first axis concerns the type of activity, before the CODP, or at/after the CODP. The second axis is the location: at the supplier, at an intermediate facility (for example of a third party logistics supplier), or at the Original Equipment Manufacturer (OEM-er). This last option may seem like no outsourcing at all. However, as will be demonstrated with the Scania case, material handling activities can also be done by a third party within a warehouse owned by an OEM-er. Each option should be assessed for four operational performance criteria: cost, delivery speed, reliability and flexibility. Quality is of course equally important. However, this point is left aside since quality is more related to the way the materials are handled, then to the place or party who does the work. Before the framework can be applied, it should more or less be adapted to fit the needs of the specific user. For Scania, it turned out that it was handy to divide the materials in their supply chain in different categories on the basis of their size and the supplier transport distance. Lack of space in the logistic centre of SPZ was the primary motivation to investigate the possibility to outsource material handling activities. A Pareto-analysis showed that a small number of rather large parts, like noise shields and air tanks, consumed a relatively large part of the available space. Therefore, the possibility to outsource the material handling of these parts was investigated in detail. Interestingly, one of the arguments against outsourcing often was that the solution contravened lean principles. For example, outsourcing could bring non-value added activities like extra loading and unloading. An option with good potential turned out to be the outsourcing of the material handling of cross members, air tanks and noise shields, at a position before the CODP. Moving those activities to an intermediate facility would lead to an increase in personal and transport costs, and it would give extra loading and unloading. Therefore it seems that – although probably temporarily - it is the best option for SPZ to re-arrange or extend their own warehouse capacity. After that, part of the material handling, considered as non core-business, could then possibly be outsourced to a logistics service provider. In addition, part of the material handling could be done at a location a bit further away from the assembly line, which would only lead to a small increase in transportation costs. Reliability and flexibility would not change, since all materials to be handled would still be located at SPZ.